Chances are, whether you're a seasoned author or an aspiring scribe, you've grappled with your share of rejection, setbacks, and heartbreak. However, literary agents say the number one key to writing success is perseverance in the face of disappointment. 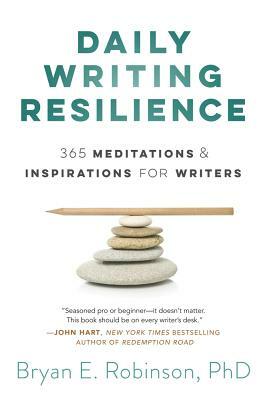 Daily Writing Resilience provides advice, inspiration, and techniques to help you turn roadblocks into steppingstones. You'll find tips and support through exercises such as meditation, breath work, yoga, stress management, gratitude, de-cluttering, sleep, exercise, mindful eating, and more. These 365 meditations will help you navigate the ups-and-downs of your writing practice, creating positive habits that will guide you toward the success and fulfillment that you've been seeking. Bryan E. Robinson (Asheville, NC) is the author of 35 nonfiction books and two novels. His books have been translated into thirteen languages, and he's been featured on 20/20, Good Morning America, ABC's World News Tonight, NBC Nightly News, NBC Universal, The CBS Early Show, CNBC's The Big Idea. Robinson maintains a private psychotherapy practice and lives in the Blue Ridge Mountains with his spouse and four dogs. Visit him online at www.bryanrobinsonbooks.com.